Visit RSVacations.net to select your Big Bear Cabin and enjoy super savings on your summer getaway. Book today!! This offer is good for NEW reservations only with stays between 7/22/15 and 9/3/15. Cannot be combined with ANY other offer or discount. Discount will automatically apply for participating properties. See full details on our website. Perfect, summer weather is in store for Big Bear Lake this weekend and beyond, with highs in the 70’s and the potential for afternoon thunderstorms. There are few things more refreshing than a quick thunderstorm in the mountains. Just beautiful! If you are looking to escape the heat, this is the perfect time to join us at 7000′! There is something for everyone to do this weekend including live, outdoor music for a cause, the world’s shortest parade, a flower show, a xeriscape tour, a paddlefest and more! Get all the details on this coming weekend’s events from the flyer below. Spend the weekend making memories under clear, blue skies and perfect temperatures. Another great reason to head to Big Bear this summer? We have added new, summer specials that make getting away for the weekend a little easier on the wallet. Stay with us 3 nights but only pay for 2. Can’t get away for 3 days? That’s okay, we are also offering 20% off on a 2 night stay! Head on over to RSVacations.net and pick out a clean and comfy cabin. The special will automatically apply. Book your Big Bear Cabin today!! See you soon! Do you like to paddle? This weekend brings the 8th Annual Paddle Fest to Big Bear Lake, Whether you prefer to canoe, kayak or stand-up paddleboard (SUP), this is the event for you! Challenge yourself and others, get great exercise and have fun in this yearly event. See all the details below. If you are looking for a great deal on a cabin for your stay, RS Vacations has you covered! We have just added summer specials to our website – 3 Nights for the Price of 2 OR 20% off a 2 Night Stay – check them out HERE. The savings will automatically apply when you book online at RSVacations.net. Book your perfect Big Bear Cabin today and get paddling!! 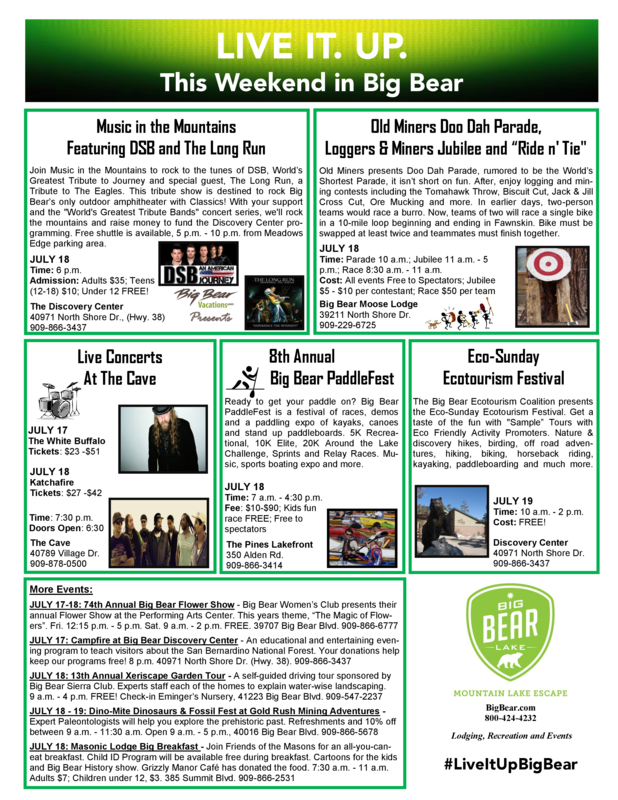 For up to date information and complete schedule please go to www.bigbearpaddlefest.com.